Mount Saint Mary’s graduate Vince Molesky has set a flame to a path so far this year that shouldn’t go unnoticed. This young man went un-drafted out of a Division I institution, was fortunate enough to latch on with Independent baseball and a team called the Wichita Wingnuts of the American Association in 2015 but was quickly traded to the Gateway Grizzlies of the Frontier League. While he adjusted in his first year of pro ball, 2016 and 2017 he led the Frontier League in strikeouts. This year Vince aged out of the league and has made the fortunate transition to the premier Independent league, the Atlantic League. 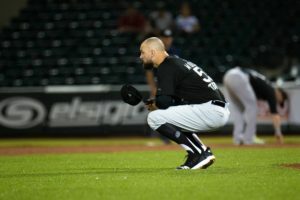 The league is bursting with former and current Major League players looking to get back into affiliated baseball. The competition is fierce. He has joined some reputable company. How well is he doing so far in 2018?… Not to shabby leading his team in strikeouts (29, the entire league in ERA (1.30), and a dazzling WHIP (.99). Vince has been working with Dustin Pease since 2013 on improving his command with many of the methods and strategies Dustin has brought to fruition today with his E-Guide (Lokation Nation’s Guide to Commanding Locations) and what it would take to be productive and advance in the game. Vince’s journey has been an inspiration to many while improving himself as a pitcher, and proving his worth with time. We took the time to catch up with Vince and ask him some questions about his journey so far, and more about his strategies that have led him to his success. Enjoy. Pease: What would you say the biggest difference was from a pitching standpoint going from Division I baseball to professional baseball? Molesky: From a pitching standpoint, the biggest difference between Division I baseball to professional baseball was eliminating the amount of misses you have over the middle of the plate. In professional baseball that will end your career. In college you could get away with a foul ball or lazy fly out. To help myself with this I would split the plate not thirds. The outer third and the inner third. For instance, if I would be pitching inside to the inner third then my location would be anywhere from the black corner of the plate to the white chalk line of the batter’s box. Pitching to the middle of that zone is allowing me to have room for error but not miss over the plate. Quality misses. Pease: After going undrafted out of college and spending three years in the Frontier League, how has the transition been heading into the premier Independent League, the Atlantic League for the first time? 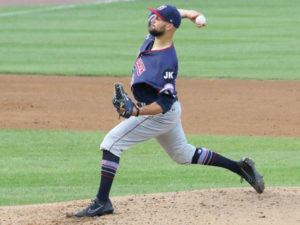 Molesky: The hardest thing for me was going undrafted out of college with not even a a spring training invite and not knowing whether or not I was going to ever get the chance to fulfill my dream of playing professional baseball. The Frontier League was a grind, especially for three seasons. However, I was grateful for the opportunity and I was pissed. I thought I had what it takes to get an opportunity to play affiliated baseball. I was hungry though and wanted to prove people wrong. Show them that I have what it takes to be successful at any level and I firmly believe that. That now shows in the Atlantic League. Getting this chance is almost like my Major League, getting to play against and learn from former and and current Major League guys. I’m going to continue to build and learn off each and every opportunity I get. 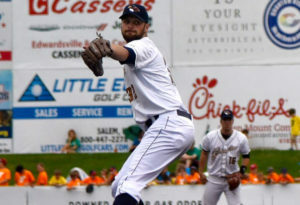 Pease: You led the Frontier League in strikeouts the previous 2 consecutive years. 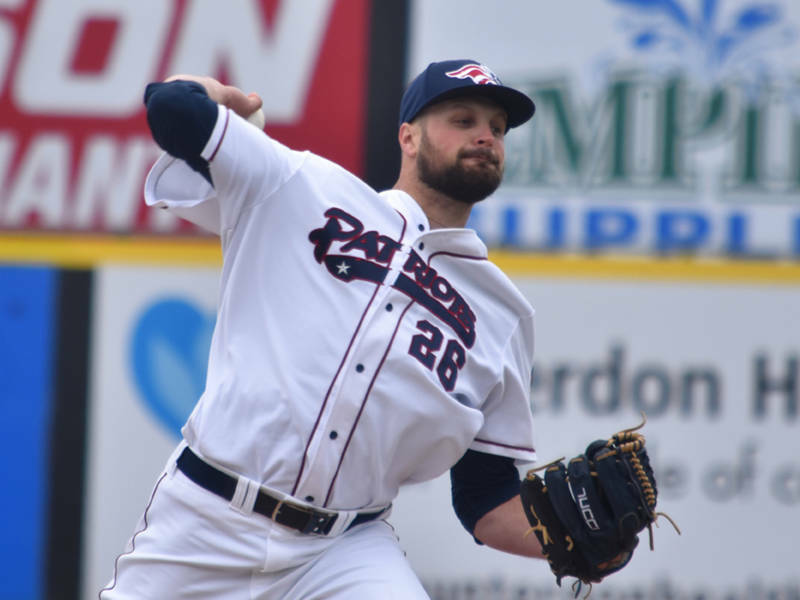 You are now leading the Somerset Patriots in strikeouts this year while leading the entire Atlantic Leage in ERA. At 88-91 and a RHP, where is your success stemming? Molesky: The success I’ve had so far this year and over the past two years leading the Frontier League in strikeouts is simply stemming off of location, command, and change of speeds. Being the type of pitcher that I am need to do all three of those things in order to be successful. Now, I don’t believe I throw slow at 88-91, it isn’t fast but I change speed and keep hitters off balance to the point where that 88 looks like 93 to a hitter when effectively locating. Having command and the ability to locate at different velocities has lead me to all of my success. Pease: What locations do you typically find yourself utilizing? Does your sequencing affect your strategy? Molesky: I don’t specifically throw to one location. My strategy is to throw to as many locations as possible in and around the strike zone. In, out, up and down staying away from the middle of the plate as often as possible. If you tend to sit in one location, then a professional hitter will easily adjust to that sequence. Therefore, I rarely throw the ball in the same location multiple times to the same hitter, however if that batter cannot prove himself to be able to layoff a certain pitchin a certain locations then I will try to live there all day to him as long as I’m getting outs. Pease: How much bearing does pitching command have your career? Molesky: If I weren’t able to locate or be able to change speeds and command my pitches then there wouldn’t be a career for me. Being able to command, locate, and change speeds has made my career and turned my career in quite a successful one so far. Without command, I have no success in this game. I’m truly thankful for all that I have learned, the knowledge gained, leading me to this point of my career. If and when more opportunity comes knocking, I’ll be ready.